Surveyed through the Millvale Library Community Needs Assessment and identified by the community led Millvale EcoDistrict Pivot Plan, affordable housing and workforce development emerged as key priorities. In support of these identified needs, New Sun Rising is leading a pilot project that will simultaneously work towards addressing these needs. NSR will be providing programmatic development and technical assistance to build and strengthen the neighborhood-specific contractor workforce here in Millvale, while also supporting general workforce development and affordable housing needs. Millvale-based development company and project partner, Chunky Skunk Holdings, has acquired a property at 1141 North Ave. in Millvale. The project will provide contracting work for local residents, and once rehabbed, become a pilot affordable housing project. The purchase of this property was made possible thanks to financing by the Borough of Millvale Revolving Loan Fund. 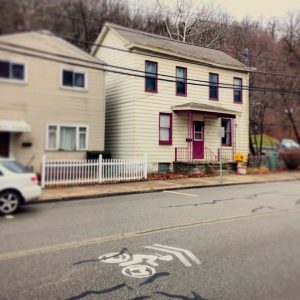 The Millvale Ecodistrict Plan’s Equity section calls for action to “Maintain affordability and build community wealth” through encouraging “property acquisition by existing stakeholders to prevent displacement of current residents.” The Equity section makes multiple references to using a variety of affordable housing strategies. Also, the Millvale Community Needs Assessment identified a number of residents who are currently renting (and vulnerable to rising rental costs) who would like to purchase a home in Millvale and are interested in assistance. This program is also being developed in response to that resident feedback. Zaheen Hussain, New Sun Rising’s Director of Sustainability will be completing Radon testing using radon monitors checked out from Millvale Community Library. Additional testing will identify environmental health conditions and potential hazards. The initial build-out will be completed with the help of community volunteers, and professional contractors hired will be Millvale resident contractors. After the rehab process, the property will be made available for sale to an income qualified family from Millvale. Those interested in becoming more involved in this process or who want to learn are welcome on-site on Saturday, April 28th for a volunteer Spring cleaning and open house. Members of North Hills Community Outreach, The Borough of Millvale, Millvale Veterans of Foreign Wars, Millvale Community Development Corporation, Millvale Community Library, Business Association of Millvale, and Emergence will all have representatives volunteering and joining the clean up on the 28th.